Nicknamed the “Grey Ghost,” weimaraners have a distinctive coat that gives them a regal and instantly recognizable appearance. Their short, smooth coat gray coat ranges in shades from charcoal to silver and their eyes (typically amber, gray or blue-gray) maintain the pallid look of the dog. This majestic and unique coat color is draped around an athletic and muscled frame consistent with the look of other pointers – albeit it with a docked tail – and conveys the appearance of speed, stamina and grace. The breed standard mandates that they max out at 27 inches in height and 80 pounds in weight, with females being smaller. Recognized by the United Kennel Club, long-haired and “blue” weimaraners are considered to be disqualifications in the conformation ring by the American Kennel Club. The weimaraner was originally developed as an all-around hunting dog for nobility in Germany during the early 19th Century. It was expected to hunt boar, bear and deer, but as big game became scarce in Europe it was used to hunt smaller game such as foxes and rabbits. In modern-day America, the weimaraner is primarily used as an upland-game-bird dog to hunt pheasant, quail, chukar, grouse and the like. While they have webbed feet and were likely, as was the German tradition, bred to be all-around gun dogs, including proficiency in water, they are thin-skinned dogs that lack an undercoat, so subjecting them to extremely cold water in a hunting situation could have negative consequences. Unlike most dogs of the time, weimaraners were bred to be a part of the family and maintain that temperament to this day – they’re good with children and have a desire to be with and please their owner, which helps in training. It can also lead to the dog working in closer range to the hunter than other pointing breeds when in the field. 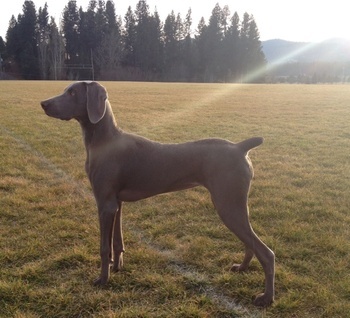 As athletic hunting dogs, weimaraners require constant and consistent exercise. Failure to provide an active dog such as a weimaraner with this outlet will usually result in behavioral issues – barking, digging, chewing, etc. If you don’t hunt, consider learning about agility clubs and events in your area. Recognized as an official breed by the AKC in 1943, weimaraners traditionally rank in the neighborhood of the 30th-most registered dog by the organization. Generally healthy dogs, weimaraners have a low incidence of hip dysplasia and genetic disorders. They are prone to gastric torsion, or bloat, as well as skin allergies. One genetic disorder weimaraners have been affected with is hyperuricosuria. Hyperuricosuria is an inherited condition that causes elevated levels of uric acid in the urine. Crystals of uric acid may combine to form stones, also called uroliths. Affected dogs that show symptoms most commonly present with frequent urination, blood in the urine, and difficulties urinating. They may also have loss of appetite, lethargy, weakness, vomiting and pain. Urinary tract infections may be common. During the week of Nov. 25- Dec. 1, you can receive 10-percent off of the cost of screening your weimaraner for hyperuricosuria by using the code “FBWEI” upon checkout! You offer 12 genetic tests for the Labrador retriever. Why does this breed have so many tests?